The Cool Mountain Education Fund promotes education for community sustainability through supporting the graduates of Yangjuan Primary School. Yangjuan Primary School was built to educate the children of four villages of the Upper Baiwu Valley: Yangjuan, Pianshui, Zhuchang, and Gangou, all of whose inhabitants belong to the Nuosu Ethnic Group, part of the officially designated Yi minority nationality of Southwest China. Yangjuan Primary School operated from September, 2000 to July, 2016. It was dedicated to comprehensive education from Kindergarten through 6th grade. 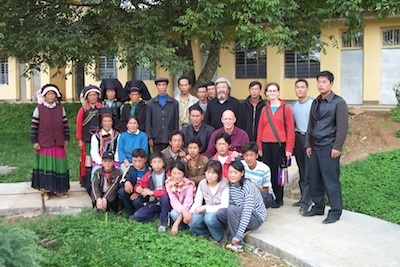 The school was built with support from friends in Sichuan, Taiwan, France, Spain, and the US, while village families contributed much of the construction labor. There were originally 4 classrooms, plus teachers’ dormitories, guest rooms, a kitchen, and an office. We had expected about 80 children to register for first and second grades, but 140 signed up, and a kindergarten was added to accommodate the youngest children. A new classroom building with four more rooms was added in 2002. One grade was added each fall from 2001 through 2004, and the first class graduated in summer 2005. At its maximum between 2005 and 2010, the school served over 300 students. After 2010, the number of students enrolling in Yangjuan declined yearly, until the total enrollment in school year 2015-16 was only 76. Many families were leaving the Yangjuan-Pianshui area, while others sent their children to board in large, modern, well-equipped schools in Yanyuan City or elsewhere. 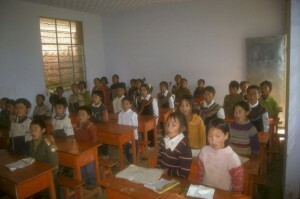 In June 2016, the Yanyuan County Education Bureau closed Yangjuan Primary School, the last village school in Yanyuan county that continued to operate. When Yangjuan School opened, children entering kindergarten typically knew only their native Nuosu language, and understood little or no Chinese. From kindergarten through second grade, classes were taught bilingually, allowing the children to adjust gradually to education in Chinese, which for them was a foreign language. Starting in the third grade, they began to learn the Nuosu written language, though all their other classes are taught entirely in Chinese. The day typically started with twenty minutes of zaodu or “early recitation,” as students, sitting in their classrooms with no teacher in attendance, read aloud in unison from the texts for their Chinese language class. After this the first class started; core classes are “language,” which means Chinese language, and mathematics. A few times a week, students had supplementary classes, in music, art, physical education, natural science, and work projects. Along with Nuosu writing, in the fourth grade they started English. School went from 8:30 to 3:30; there was no lunch break, only a mid-morning assembly for announcements (always in the Nuosu language) and calisthenics, so parents had to feed their children well in the morning before school. Classrooms and equipment were rather spartan. Students sat at wooden desks on hard, wooden benches, and in the lower-grade classrooms, which had more students, sometimes three had to crowd around a desk designed for two. Concrete classroom walls were decorated with slogans and sayings from China’s leaders about the importance of education. When a teacher banged on the gong to signal the start of each period, students scampered from the schoolyard into their seats; they had to arrive before the teacher. As the teacher entered the room from the front, the students all stood up and shouted in unison, “Laoshi hao,” (“Greetings, Teacher), or if it was a Yi-language class, “Hmamo Va!” which means the same thing. Most of the class consisted of the teacher explaining things, calling students to the blackboard to write or do problems, or calling on students to answer questions. Sometimes they did brief in-class assignments and passed them in. At the end of the period, they rose again and shouted, “Laoshi zai jian!” “See you again, teacher,” and waited until the teacher had left the room before they went back out into the schoolyard. Over the course of its existence, Yangjuan School had from four to eight regular, credentialed teachers, who received salaries from the Yanyuan County Educational Bureau. Most of them, including Sha Kaiyuan, who was Yanjuan’s only principal, were Nuosu, though there were usually one to three Han Chinese. This was never enough teachers to meet the curricular needs of the school, so in addition the School hired from four to six “substitute” teachers, who had not passed the credential test, and whose salaries were only partly paid by the County; Cool Mountain was sometimes able to supplement the substitute teachers’ salaries. Yangjuan School faced considerable hardship and adversity–a remote location, not enough teachers, spartan facilities. But its record has been and continues to be outstanding. For several years in a row, student test scores were among the best in the entire county, at times comparing with those of the urban schools in the county town. When the first class graduated from Yangjuan, 11 of the 34 students tested into the Yanyuan County Nationalities Middle School, and four passed a special test for admission to the even more prestigious Prefectural Middle School in Xichang City. It was then that Cool Mountain was formed, and began giving scholarships to enable and encourage these students to continue with their education. Since then, Yangjuan graduates have continued to excel, and the numbers continuing to middle school and high school have grown each year. In 2011, 15 Yangjuan alumni graduated from high school, and all 15 were admitted to junior college or four-year college programs. The first class of three-year college programs graduated in 2014, and there have been over 20 college graduates since. These graduates are now employed as elementary and middle school teachers, local officials, and corporate office workers. They are the community leaders of tomorrow, and their education will continue with your support.